When you’re a new parent, you try to be as prepared as possible for every situation. One thing most parents don’t learn about or can’t prepare for before birth is the possibility of dealing with baby skin care or baby acne. Experts have yet to agree upon a single cause of baby acne, but many believe that it’s caused by mom’s hormones during the end of pregnancy. One thing we do know is that baby acne and adult acne or adolescent acne are not quite the same, mainly due to the fact that acne later in life can easily be traced to its root cause. Baby acne also differs from regular acne in that it generally does not return after it has resolved. Regardless of what causes baby acne, most parents want to help their baby’s skin heal and stay healthy. That’s where ATOPALM comes in. 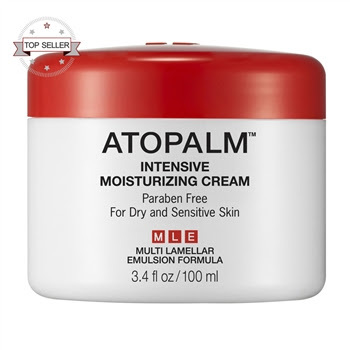 Intensive Moisturizing Cream was originally formulated to treat eczema in babies and children. Today, it’s our best-selling formula for people of all ages, and many new uses have come to light — one of which is caring for baby acne! Rather than attempting to dry out or directly treat blemishes, Intensive Moisturizing Cream works by targeting whole skin health. It protects and supports the skin’s natural barrier so that the skin is able to better heal itself, including acne blemishes.